Rarely in life do we get to have our cake and eat it too, but with our luxury vinyl flooring in Bel Air, MD, that is exactly what you get to do. Luxury vinyl combines the cost-efficient qualities of synthetic flooring materials with the beauty of natural materials like stone and hardwood. 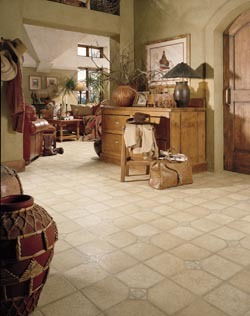 With this type of flooring, you’ll the look you want at a price you can afford. Visit our showroom today to see what we have to offer. Does Your Flooring Keep up with Your Life? Pets, children, and day-to-day foot traffic take their toll on your flooring. If you live anywhere long enough you will start to notice that high-traffic areas start to look dingy and unsightly. The good news is you don’t have to live with worn-out flooring. Thanks to the durability of LVT, you can have flooring that continues to look great after years of use. Water Is No Longer a Problem with LVT! Not only is luxury vinyl tile some of the most durable flooring on the market, it is also some of the most water resistant as well. If you want the look of wood in your bathroom, kitchen, or basement, this is the flooring choice for you. LVT is waterproof, and as long as the edges are sealed properly, you won’t have to worry about water getting into your flooring or subfloor. That is why it is vital that you invest in proper luxury vinyl flooring installation. Our experts have the skills, knowledge, and experience to make sure that your flooring is properly installed to give you the most water resistance possible. With proper installation, you can have the look you want in any room of the house, without having to worry about wear and tear again. Contact us to learn more about the great benefits of LVT flooring. We serve residents of Bel Air, Fallston, Forest Hill, Abingdon, and Kingsville, Maryland, as well as the surrounding communities.